This is a campaign sign to Re-elect Gary Hannig for Illinois State Representative. He served in the Illinois House for 30 years, from 1979-2009. It is impossible to tell from which campaign the sign belongs, due to its excellent condition and classically styled font. Rather than use the term, "Democrat" or any other terminology, the sign has an image of a donkey, the long-regarded symbol of the Democratic Party. 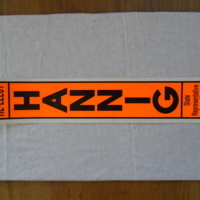 “Gary Hannig Campaign Sign,” UIS History Harvest, accessed April 22, 2019, http://uishistharv1.uis.edu/items/show/209.